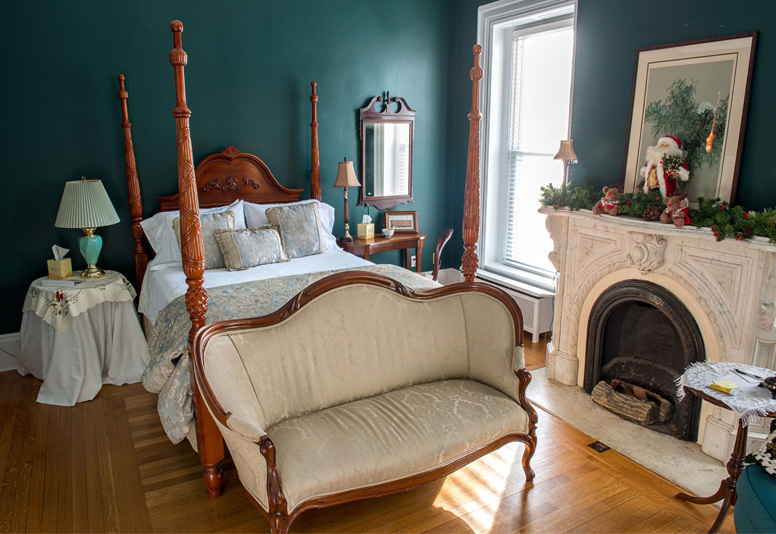 Ideal for the semi-handicapped and those who have difficulty with stairs, this first floor guest room has a marble fireplace (inoperative) and is furnished with a queen size carved four-poster bed, large armoire with TV, skirted nightstand & antique nightstand. The room’s dark green walls accentuate the heavy white door & window moldings. An antique settee sits at the foot of the bed to watch cable TV and a cozy wing chair sits beside the fireplace. A large closet is to the right as you walk in. The shower bathroom has handicap bars and a special dual head massage shower system for a wonderful showering experience.